Hawaii’s Campaign Spending Commission claims that its “mission is to maintain the integrity and transparency of the campaign finance process by enforcing the law,” including “making sure everyone has the opportunity to ‘follow the money,’” especially for “ballot issue committees.” Unfortunately, in the lead-up to last November’s state constitutional convention referendum, this language proved to be mere feel-good political pablum. On the morning of Nov. 5, immediately after I spotted the violation, I called the Commission after first notifying the Office of Elections. My hope was that the Commission would issue a press release—or at least send out one of its innumerable tweets—notifying the public of the violation. The deterrence of the $25 fine on Preserve Our Hawaii was obviously negligible. As of the Nov. 6 election, Preserve Our Hawaii had raised $740,000.00 and spent $662,529.5 to defeat the referendum. Virtually all that reported sum went to advertising, including the design and distribution of the ads. Note that most non-media expenditures, such as in-house staff used for conducting polls, focus groups, and other research on the referendum; organizing the no coalition; and hiring and then managing the various outside contractors, were exempt from disclosure. Preserve Our Hawaii’s last payment to the Star-Advertiser was $23,283.01on Oct. 30, presumably for its Nov. 5 front page ad. All of Preserve Our Hawaii’s contributions came from government unions, including four-fifths from two of Hawaii’s most powerful unions, the Hawaii Government Employees Association and the Hawaii State Teachers Association (most of the latter’s contribution came from its parent union’s $60+ million ballot campaign fund). Disclosing this information would have undercut Preserve Our Hawaii’s message about powerful special interests supporting but not opposing a convention. 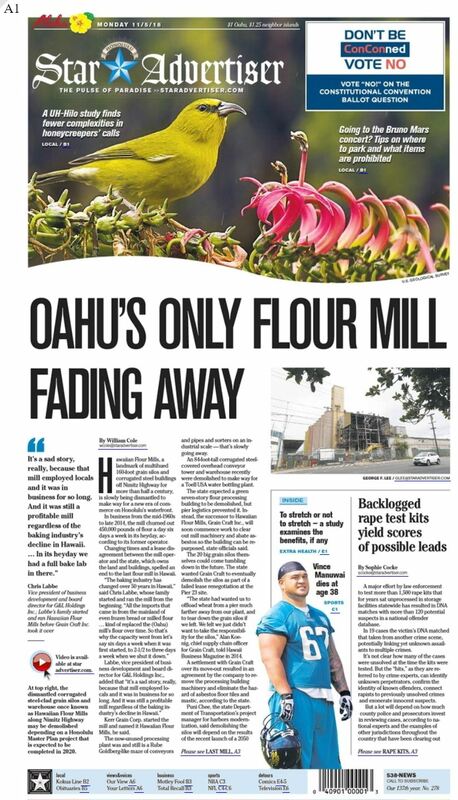 Some readers may have assumed that the front-page message was the Star-Advertiser’s own editorial position. After all, not only was the message its editorial position, but the law required that if it wasn’t the ad would have to include a disclaimer. Trusting readers would presumably have expected the Star-Advertiser to comply with Hawaii’s campaign finance disclosure laws, given that it has often editorialized in favor of the principle behind those laws. A good starting point to break the Star-Advertiser’s monopoly power in Hawaii would be to end its highly profitable monopoly over government mandated legal advertising, which the state legislature granted it. The subsidy makes the Star-Advertiser beholden to legislative leaders, which is bad for press independence. J.H. Snider is editor of the The Hawaiʻi State Constitutional Convention Clearinghouse and author of Does the World Really Belong to the Living? The Decline of the Constitutional Convention in New York and Other US States, 1776–2015.